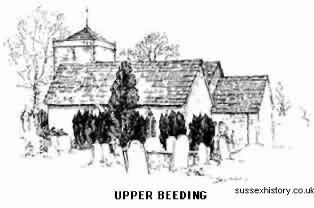 Bramber village is most picturesque and attractive; its size renders it difficult to believe that within living memory it returned two members to Parliament. Some amusing stories are told of the exciting elections in olden days, when as much as �000 were offered and refused for a single vote. 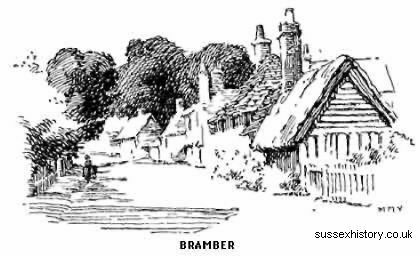 This "borough" once returned Wilberforce the Abolitionist, of whom it is told that on passing through and being acquainted with the name of the village exclaimed "Bramber? why that's the place I'm member for." The church lies close under the south wall of the castle; only the nave and tower remain of the original cruciform building. Although the arches are Norman and show the original frescoes, a claim was made by Dr. Green, Rector in 1805, that "in rebuilding the church at his own expense about twenty years before, he had no assistance except that the Duke of Rutland and Lord Calthorpe, joint proprietors of the borough, each gave �, Magdalen College � and Mr. Lidbetter, an opulent local farmer, �; but the Duke of Norfolk, Lord of the Manor, nothing!" This "rebuilding" refers to the re-erection of the tower arches, the space between being converted into a chancel. New windows in Norman style were inserted in 1871 to bring the east end into harmony with the nave.